In a few days, the world’s largest democracy would exercise its mandate. As usual, the political parties would indulge in all possible moral, amoral and immoral means to garner votes. The middle-aged and the old have reached a stage where they expect very little from any political parties. They would be ambling to the polling booths, if at all, with the baggage of their cynicism and frustrations. Prejudices have scarred their conscience. They have grown resistant to new ideas and opinions. They can afford to do all these. They have little at stake. 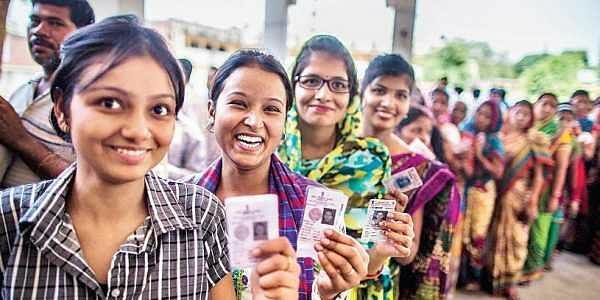 India is a young country with a median voter age of 27.9 years. Approximately, 4.5 crore new voters would be exercising their mandate for the first time. All the political parties are trying to woo the youth. As expected, they are using the dirty old tricks with which they had trapped the past three generations. Think from the position of a political strategist: You must convince a billion people to vote for you. You can try to convince the voters that you would bring more jobs for them, provide good quality education for their children, protect law and order, build hospitals and roads etc. Going by the past record, it is doubtful that any voter would believe such promises. In the last 70 years, the political parties have made a farce of the election manifesto. How do you convince the voter to vote for you? The easiest commodity to sell is fear. Religions knew about this thousands of years ago. They used fear of others, fear of Satan, fear of pollution, fear of hell, sin and God to propagate their faith. Politicians use the same trick. Create an atmosphere of fear, stoke the inherent prejudices in the society. Say the ‘Other’ is going to take over you and rule you or eliminate you. Generate a feeling that they have been wronged and the entire world is conspiring against their religion. The politicians talk about the wrongs that happened hundreds of years ago and say their ancestors wronged your ancestors and hence you should take revenge by voting for us. What these politicians are appealing to are your animal instincts. They are herding the sheep by crying ‘wolf wolf’. They would divide you by language, religion and caste. The previous three generations of democratic India had fallen for such tricks. Hence, we had religious riots where Indians butchered other Indians, we had language riots where Indians burned Indian cities. We voted for politicians not because they were good, but because they belonged to our caste, religion, etc. We wanted to teach our neighbour who follows a different faith or spoke a different language, a lesson. They told us if we voted for them, they would banish poverty. We believed them and they looted us. We were fools and we, the middle-aged and the old, are happy to remain fools. Through clever social media management, spread of fake stories and tapping into our inferiority complex and fears, they have turned us into a herd of sheep that can be fleeced at their will. We bleat to their tunes and feel happy when they feast on our flesh. Don’t repeat our mistakes. When they come for votes, ask them straight questions. If they say they are going to protect you from the people of another religion who they want you to hate, smile. Say that you trust in the Indian police, judiciary and armed forces to protect you. Say that you trust in the Constitution. Ask them, whether they don’t believe in these institutions. Ask them how they are going to create jobs for you and not dole out goodies or provide free income. When they talk about some historical atrocities, ask them to stop talking about the past and start talking about the future of you and your country. If they talk about the temples, mosques, gurdwaras and churches, ask them about schools, hospitals and roads. When they try to make you feel guilty by invoking the sacrifice of our soldiers, express your respect for our soldiers, but don’t forget to ask how many of their children are serving in the armed forces. And what they have done about the pensions of ex-servicemen or for rehabilitation of war widows. When they talk about what their dynasty or their self-service organisation or their party did for the country, talk about the 70 percent of Indians who live in abject poverty. When we attained the voting age, most of us forgot to ask these questions. Some of us fought for and against ‘Mandal, Mandir and Masjid’. Some went on a rampage when a leader in power was killed and massacred innocent people. Some rioted to bring their leaders to power. The rest of us remained indifferent. A few lucky ones went on to create successful careers before becoming bigots or opportunists, or both. A few became rich and powerful, exploiting the loopholes in the system. Some looted and fled the country. Some became the struggling, chattering, middle class and joined the rat race and mutated into aggressive and competitive rodents. Some escaped to developed countries, only to turn into blood-thirsty hyper-nationalists spreading hatred between communities. The silent majority rotted in the villages. They are still waiting endlessly for the politician to dole out some money or waiver of loans. Some migrate to cities when the villages can no longer feed them. You may have seen them living under the flyovers and slums. They often knock at the car windows of their lucky fellow citizens. Who has time for them when we are sitting in the bubble of our air-conditioned cars, enjoying our success in this dog-eat-dog world? Are we not busy forwarding the WhatsApp posts about the good times, of the old, the present and the future? We have screwed up as a generation. It is up to you to not repeat our mistakes. Ask the right questions and choose your future wisely.